Ready for some holiday cheer? So are we. Wishing you a berry merry December. We’ve posted about shrubs before. Back in June we made a nonalcoholic Berry Shrub. Then we used that to make a Rum Shrub Cocktail. To prepare a shrub drink, you need shrub syrup, which is a mixture of fruit, sugar, and vinegar. Shrub syrups date back hundreds of years; they offered a handy way of preserving fruit before refrigeration came along. Now that December has arrived, we decided to make cranberry shrub syrup. And since citrus is in season, we’ve added a bit of orange to the mix. Below you’ll find two recipes – one for cranberry shrub syrup, and another for a cranberry shrub cocktail with bourbon. Prep time for the cranberry shrub syrup is only about 15 minutes. But you’ll need to let the syrup age for 2 days so that the flavors can blend together. Our cranberry shrub syrup recipe yields about 2 cups. It keeps well for several weeks if refrigerated in an airtight container. Prep time for the cocktail recipe is about 5 minutes (assuming you have cranberry shrub syrup on hand). It serves 1. In the Notes, you’ll find a recipe for a nonalcoholic version of this drink (along with a gin version, just for good measure). Our cranberry shrub syrup recipe is adapted from one we found in Michael Dietsch’s Shrubs: An Old Fashioned Drink for Modern Times. The cocktail recipe is our own original concoction. Wash and dry the orange. Using a vegetable peeler, remove the zest from the orange (try to include as little of the white pith as possible). Place the zest in a nonreactive bowl and add the sugar. Muddle the zest and sugar together (use a cocktail muddler or the back of a ladle or large spoon). Keep muddling for 5 minutes or so – you want to infuse the sugar with the oils from the orange zest. Once you’re finishing muddling, cover the bowl with shrink wrap and let sit at room temperature for an hour or two. Then fish out the orange zest and discard it. Meanwhile, juice the orange and place the juice in the refrigerator to chill. Wash the cranberries, picking out and discarding any bad ones. Pour the cranberries into the bowl of a food processor, along with the cider vinegar, and purée. Add the cranberry mixture to the muddled sugar (make sure you’ve fished out the zest). Then add the cinnamon stick and the reserved orange juice (from Step 2). Stir the ingredients well to mix, then cover the bowl with shrink wrap. Refrigerate the mixture for 2 days, stirring once or twice a day. After 2 days, strain the cranberry mixture and discard the solids. Pour the cranberry syrup into a glass jar or bottle. Cover tightly, then shake the jar to combine the ingredients thoroughly. Label the shrub syrup jar/bottle and refrigerate it. Before using the syrup, shake it again to combine the ingredients (the sugar can sometimes separate). Place all ingredients (except garnish) in a cocktail shaker half-filled with ice. Shake well until thoroughly chilled (about 20 seconds). Strain into a cocktail glass, preferably one that’s been chilled. Garnish, if you like, and serve. About infusing sugar with the oils of orange zest/peel: Much of the flavor of citrus is in the oily peel (the colored part, not the white pith, which tends to be bitter). By muddling the zest together with sugar (and letting the two mingle for an hour or two), we’re transferring most of the citrus oil to the sugar. Technically, what we’re making is an oleo-saccharum – oily sugar. It’s a neat trick that really works, although it does take a bit of time (most of it unattended). We like to serve this drink “up” in a cocktail glass. But if you prefer, you could serve it in a rocks (Old-Fashioned) glass over ice. Want to make a nonalcoholic version of this drink? Add 1 or 2 ounces of cranberry shrub syrup to a tall glass filled with ice. Add 4 to 6 ounces of seltzer water or ginger ale. Stir and serve with a straw. Add an orange slice for garnish, if you wish. Prefer to use a spirit other than bourbon? You can substitute dry gin if you like. The drink isn’t quite as interesting, in our opinion (it tastes a bit like alcoholic cranberry relish). But it’s a fun change. Speaking of bourbon, there’s no need to use a pricey brand for this cocktail. We like to use Evan Williams for mixed drinks. But any name-brand bourbon should work fine. BTW, we haven’t made this drink with rum yet, but think that would work pretty well too. Try a dark or amber rum. We’ve made this drink both with Cointreau and Grand Marnier. Both iterations are good. We tend to prefer the Cointreau version, but only by a little. We should note, however, that Grand Marnier combines very well with rum. So if you’re making a rum version of this drink, try Grand Marnier first. We use orange bitters in this drink mainly because we love the cranberry-orange-bourbon combo. We haven’t experimented with other bitters, but feel free to do so if you’re inclined. “Don’t you mean shrubbed?” I said. “Berry clever,” said Mrs K R.
“I’m just bourbon over with puns today,” I said. “Orange you the wit,” said Mrs K R.
Tart and vinegary, just to my taste. Such a lovely festive colour! Perfect for the holiday season, John. Hi Angie, doesn't this look nice? Love its flavor, too! Thanks for the comment. That's a lot of new information about shrubs and their history! Hi Mae, shrub history is fun. Using shrubs in cocktails is even more fun! Not to mention tasty. :-) Thanks for the comment. Hi Tricia, if you like bourbon, you'd love this! Really nice combo of flavors. Thanks for the comment. I haven't tried bourbon before but this beautiful cocktail makes me want to try it! Hi Pam, bourbon is good stuff, although for some it's an acquired taste. But a taste we've definitely acquired! Thanks for the comment. Love the idea of making cranberry shrub. 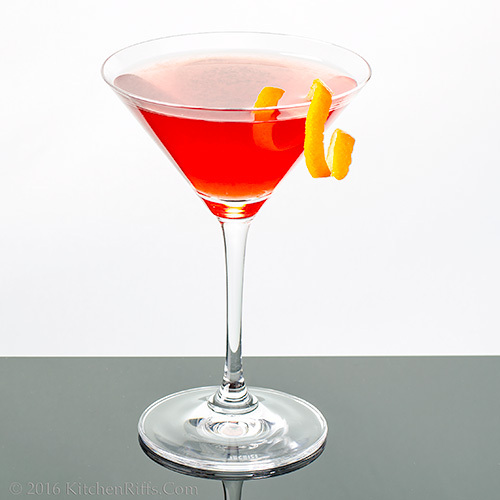 This is like an amped up version of a cosmo! I like bourbon and cranberries too. And this stunning looking cocktail is making me drool. I so want to try this very soon. Thanks for this share. Hi Evelyne, it's a great combo of flavors, isn't it? :-) Thanks for the comment. Hi Laura, it is a lot like a cosmo. Particularly if you make the gin version (the bourbon is better, but the gin is really worth a try). Thanks for the comment. Hi Anu, isn't that a wonderful pairing? So good. And the red IS rather nice, isn't it? :-) Thanks for the comment. Love your shrubs!!! 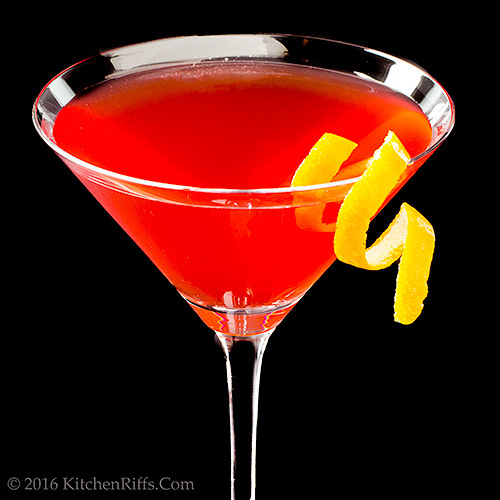 This cranberry orange one sounds heavenly and, yes, perfect for this time of year! I love soaking dried cranberries in bourbon, so I know this is a cocktail that I'd love. Fabulous cocktail John! So berry and merry! Hi MJ, this is totally berry and merry. :-) Shrubs are SO good -- we've enjoyed playing with them for the past year. :-) Thanks for the comment. What a color this cocktail has!! Looks very festive indeed. What a gorgeous drink! Fabulous flavor, perfect after all the sugary stuff. Wonder how this would work with cranberry juice? Not sure if I can wait long enough for the syrup! Thanks for posting this. I wanted to make a cranberry shrub for Thanksgiving but wasn't quite sure how to do it. Now I do! The bourbon and cranberry combo sounds awesome! And it's perfect that I can make the adult version for myself and the kid-friendly version for Mrs Yi Reservation who doesn't drink much. Hi Amira, doesn't this look festive? So nice for the season! Thanks for the comment. Hi Abbe, I've thought of mixing fruit juice with vinegar to make a shrub, but just haven't tried it. Maybe you should? And let us know? :-) Thanks for the comment. Hi Chris, you'll love cranberry shrub! The flavor is excellent. Thanks for the comment. Hi Yi, you'll like this version, and I'll bet your wife will love the kid-friendly version! Thanks for the comment. Hi John, Oh my goodness, love the color. Bourbon and cranberries sound delicious!!! Happy Holidays! Oh this sounds great! Cranberry is my favorite this tome of year. I like the idea to try it with dark rum! Hi Cheri, the color is fun, isn't it? And the flavor is wonderful! Thanks for the comment. Hi Ashley, we haven't tried it with dark rum yet -- maybe this weekend! :-) Thanks for the comment. What a festive drink!!!!! Great for the holidays! I made your berry shrub and it was delicious. I have some frozen cranberries and now I know what I am going to do with them. Prost! Hi Denise, doesn't looking at this drink put you in the holiday mood? So will drinking it! :-) Thanks for the comment. Hi Gerlinde, don't you love the flavor of shrubs? So interesting! This cranberry one is a winner. :-) Thanks for the comment. 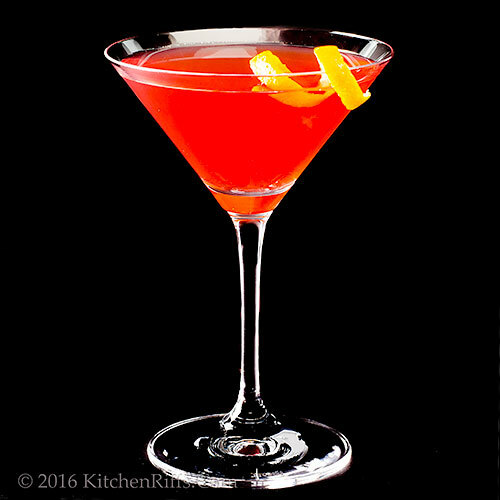 Your cocktails always are cheerful and bright. Now with all the family due to visit this will be perfect as we can make virgin ones for the kids too. Love that bright red color- very festive! Hi Bobbi, although we like shrub cocktails, just mixing the shrub syrup with seltzer makes a wonderful drink. Pretty, too. :-) Thanks for the comment. I love shrubs, especially in summer. There's just something so refreshing when that sharp acidity hits your palate. I know it's not everyone's cup of tea, so to speak. But to me, it's such a great quencher. 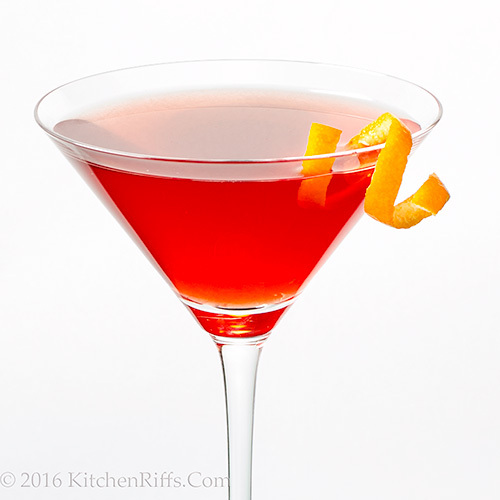 And with a bit of booze and such a dazzling color, this one really is made for a holiday celebration. Hi Carolyn, that hit of vinegar really is rather pleasant, isn't it? Although I agree with you that not everyone enjoys it. We sure do! Thanks for the comment. You bottled up (or poured yourself a glass) the holidays quite nicely if you ask me! You could close the blinds and drink this in JUNE and think it's the holiday again! Love the sound of this - and even the elf version! It's high time I steered away from wine for a while for apéro and went for cocktails. Looks and sounds deliciously festive. Cheers! wow ,this drink sounds and looks so refreshing . I'm still basking in the glow of last summer's shrub experiment. It was the hit of the party. I have no doubt this cranberry version would come off just as nicely. You two are punny! Pinned. Hi GiGi, this would actually be a really pleasant June drink -- shrubs are very refreshing! Thanks for the comment. Hi Jill, we love wine, but it's SO much fun to have a cocktail before dinner! Or any old time. :-) Thanks for the comment. Hi Baili, it IS refreshing. And good. :-) Thanks for the comment. Hi Jeff, you'll love this! I've made this shrub syrup a little bit tamer (less vinegar and sugar) so it'd mix better as a cocktail as opposed to a cooler. Thanks for the comment. Hi Lea Ann, it's a gift. Or a curse. :-) Thanks for the comment. Hi Juliana, the cinnamon adds a nice spicy note! As do the bitters. Thanks for the comment. So very festive! A wonderful way to celebrate the season! Thank you for the inspiration John. Hi Marta, the kid option is really good! Thanks for the comment. Hi Deb, isn't this nice? Looks pretty, tastes prettier. :-) Thanks for the comment. Hi Greg, :D One shrub coming up! Thanks for the comment. Hi Amalia, we had this again tonight. Because, as you point out, it's the weekend. :-) Thanks for the comment. I know I've said this more than once, nobody makes a cocktail better than you do and your photos prove that. Certainly nice for the holidays. Hi Charlie, isn't the color great? As is the flavor. :-) And yes, this is an awfully lot like cranberry sauce! But better! Thanks for the comment. In all seriousness, this is a beautiful and festive looking cocktail. I could use one right now, as the snow is falling and thickly covering the roads. It would be a perfect night to cuddle up and stay in with your beautiful cocktail, but sadly I have to go out and drive in it. Hi Eva, for this one we actually did a fair amount of testing -- but when we test, we always make one at a time and split it. It's the only sane thing to do! BTW, both of your comments came through -- I deleted the other one (I have comment moderation turned on, so they don't show up right away). And speaking of comments, thanks for yours! What a beautiful drink - so festive for the holiday season! Hi Beth, isn't this pretty? And SO tasty! :-) Thanks for the comment. Hi Amy, it's a really nice one! Thanks for the comment. LOVE this gorgeous color! And bourbon may be the only way I'll get through this polar vortex!! Seriously, this is one beautiful cocktail! Hi Liz, it's about to get really cold! Bourbon all around. :-) Thanks for the comment. Your cocktails are always so stunning. The colors and flavors scream holidays, yum yum. Hi Asha, cheers! And this is a really good one for toasting the holidays. :-) Thanks for the comment. I love the color of this drink and also the cranberry orange combination. Sounds wonderful. Hi Dawn, isn't the color great? We really like this -- will be having it again this weekend! :-) Thanks for the comment. Well now.... why would I want to make a kid friendly version huh - chuckle - the colour is so festive and I love, love, love cranberry. Awesome drink by all accounts. This cocktail just about screams "Happy Holidays!" and I love it, John. I'd never heard of shrub syrup and am so glad that you've posted instructions for making some. I do have friends who are alcohol-free and your mocktail version will be very well received. Cheers! I love the sound of this and the bright red colour too. I can just see my sipping this next to a fire! Great cocktail! Love that bourbon, esp after growing up in Bourbon Country! Pretty color too! Maker's Mark maybe? Hi Anna, the kid version actually is pretty good, although we prefer the adult version, too. :-) Thanks for the comment. Hi John, shrubs are really good! A lot of fun to experiment with. Thanks for the comment. Hi Caroline, this is wonderful to drink by a crackling fire! SO good. :-) Thanks for the comment. Hi Pam, we didn't use Maker's Mark, but its sweetness would be quite nice in this drink. Thanks for the comment. Those are the most beautiful photos. Your pics must be pinched by so many people - they are so good. Hi Maureen, shrubs are great, aren't they? And alcohol is better. :-) Thanks for that very kind comment.